Currently, services are spread across 11 hospital sites. It is central to reforms aimed at reducing disability and saving lives in Northern Ireland, where more than 1,000 people die from stroke annually. Every year there are almost 3,000 stroke-related hospital admissions. According to independent health reports, Northern Ireland's stroke services fall below national standards. Hyper-acute stroke units or (HASUs) offer the best in-stroke response and treatment. Specialists argue that expertise is currently being spread too thinly and that is denying some people access to the best care. A public consultation, which runs for 12 weeks, offers six potential models. The model with three hyper-acute stroke units includes the Royal Victoria Hospital in Belfast, Craigavon in the Southern Health Trust and Altnagelvin in the Western Trust. Another option, which suggests five HASUs, would also include Antrim Area Hospital in the Northern Health Trust and the South West Acute Hospital in Enniskillen. Daisy Hill Hospital in Newry and the Causeway Hospital in Coleraine do not feature in any of the potential models. According to the Department of Health, the proposed new network of HASUs would ensure that patients have access to the best possible care in regional centres of excellence no matter where they live or what time they are admitted to hospital. Anne Speed, of trade union Unison, said staff were only briefed about the changes this morning. "Staff will undoubtedly be feeling anxious and uncertain as to the future of the stroke units they work in, which could have been avoided if the proper processes had been followed," she said. Paul McClean, from Mageralin in County Down, was just 40-years-old when he suffered a serious stroke. He said the decision by a paramedic to bypass his local hospital at Craigavon and take him to Belfast's Royal Victoria hospital was crucial. 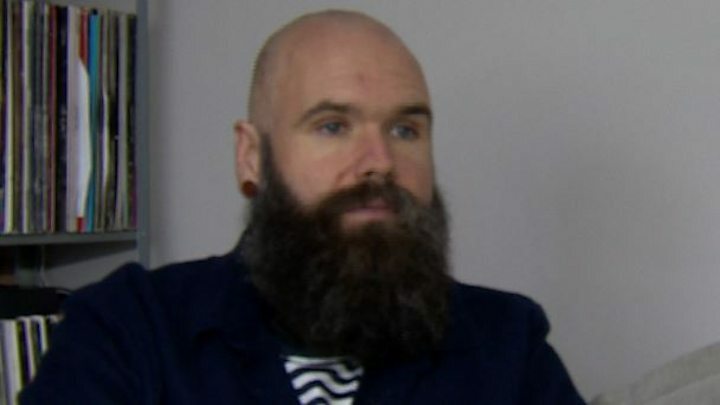 Image caption Paul McClean was just 40-years-old when he suffered a serious stroke. The 42-year-old explained that he was able to have a thrombectomy at the Royal - an operation which is not done at other hospitals in Northern Ireland. The procedure involves inserting a catheter into an artery. A small device is passed through the catheter into the artery in the brain. The blood clot can then be removed using the device, or through suction. "The idea to go to the Royal saved my life, the main stroke unit is in the RVH, and so to go there is the main reason I'm having a conversation with you right now," he said. "Going to the right hospital instead of going to the local hospital saved my life and made things better for me." Department of Health permanent secretary Richard Pengelly said: "We have an exciting opportunity to change services for the better, protecting many more people from the devastating consequences of stroke. "We can't secure these improvements without reshaping current provision. "Establishing hyper-acute stroke units is vital to ensure we keep pace with advances in treatment and provide the best possible treatment. "The principle of consolidating care is backed by stroke charities, expert research and the proven success of reforms introduced in London and Manchester." The purpose of centralising services is also to make greater availability of the clot busting drug Thrombolysis and Thrombectomy, a groundbreaking procedure that removes a clot from the brain. Currently there are eight acute hospitals which can provide thrombolysis to stroke patients. It also proposes extending the HEMS Air Ambulance service to coordinate with emergency road transport for patients with strokes and other conditions especially for those living in rural areas.